Unifor members hold a rally at the General Motors headquarters in Oshawa, Ont., on Jan. 23, 2019. The head of Unifor has ruled out a potential boycott of General Motors in the campaign to save the Oshawa Assembly Plant. Speaking at a union rally in front of GM Canada’s Oshawa office, Unifor president Jerry Dias says the union will never call for an outright boycott of GM products. Last week, Unifor’s Quebec director Renaud Gagne said there were no plans to boycott GM, but that it may be a solution the union will have to consider. 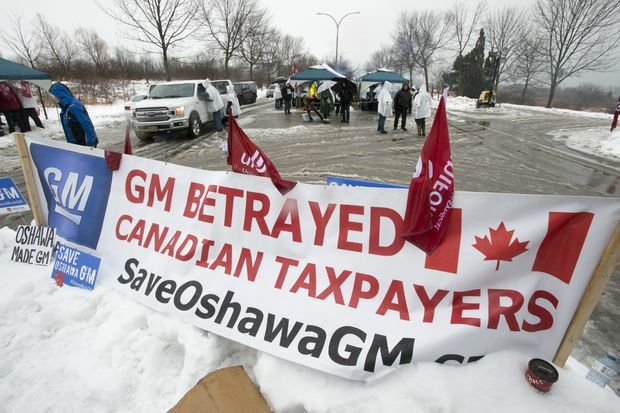 He says the union will have a press conference on Friday as it continues its fight to save the Oshawa plant that GM plans to shut down later this year.